Early childhood is a critical time for learning and growth. 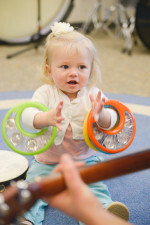 Parents can help their children develop by using music with them at home. Here are some ideas! Turn on a children’s Pandora station(Raffi is my favorite!!) and dance and sing along with the songs. This was one of my favorite ways to bond with my infant during those first months when I was so sleep deprived and we were still figuring each other out. I flipped on the music and my mood and connection with my baby instantly changed. Something about that music! Make homemade instruments together. An easy shaker idea is to get a paper plate, color it, fill it with popcorn, then fold it in half and staple the outside together. Just beware of little kernels around if your child rips it… You can also look up tons of ideas online for homemade instruments! Sing “Twinkle Twinkle” (or any other favorite song) in as many styles as you can think of. I like to include opera style, underwater style (bubble your lips with a finger while you sing), hiccups, monster style, mouse style, etc. Sing songs together with kazoos. There’s something about kazoos that kids just love!